Meet the Artist Mischa Schenkel. | .Sometimes Raw. Meet the Artist Mischa Schenkel. Mischa Schenkel loves to teach and show children how to paint. When I first walked into Mischa Schenkel’s atelier I was speechless. There was just so much artwork to look at, brushes, paint, talent and so much more. And there he stood, in the middle of it all, looking at me with a puzzled look trying to tell me that it is all not a big deal. I am not an art dealer, but I have been to the world’s best museums and have seen them all. Picasso, Dali, Rauschenberg, Monet you name it. There were weekends when I literally spent the entire day at the MET. I could totally picture and see some of Schenkel’s artwork at some big museums. He is talented, no doubt. He has drawn and painted since he could hold a pen in his hand and came up with fantastic work. His appreciation of art emerged at an early age. I saw old notebooks from his days in High school and was blown away. “There might be still some in those notebooks that might work on a huge canvas, ” he said. Now, Mischa Schenkel is 39 years old, was born in Coburg and lives currently not far from there in an atelier/home in green Franconia. He is a Lebenskünstler/Life artist. One would translate this term as a master of the art of living. And this he does. His house is a piece of art itself. Art wherever you look. When I first walked through the rooms in awe and saw all those painting I felt like being in a museum. The vintage door that leads to his garden, the old oven in the living room and the vintage kitchen are places where I would like to sit, rest, stay awhile and have a cup of tea with the artist. Why does he do what he is doing? “I simply love it. I eventually would like my house to look like Salvador Dali’s house,” he said. Talking to Mischa Schenkel, I realized that a childhood full of painting and drawing, especially when talent runs in his family, foreshadowed his artistic future. In school he loved art classes and he kept painting here and there for fun after he graduated from High school. Schenkel said he saw the movie Surviving Picasso with Anthony Hopkins and realized how great it would be to make money with his art even though that was not why he paints in the first place. Sometimes Schenkel scribbles something down in his notebooks and keeps it to later use it for another art project. Then, if it feels right, he goes in his atelier and starts painting. Other times he just watches something really closely and gets inspired. “Then I focus like a laser,” he said. He definitely likes to think freely and independently and use his phantasy while painting. How did his work change over time? He is trying to think less. Just stop overthinking many things, going up to his atelier and paint. Just doing it. Paint. What art does Schenkel most identify with? Pointillism, wish a mix of visionary expressionism that works really well together. He basically paints what comes to his mind, what he likes, what works for him. “Why art,” I asked him. “Why not,” he responded and smiled. Doesn’t this woman seem to glow and explode at the same time the longer you look at it? I love this painting so much. Schenkel loves to be in nature, live in the moment and enjoy life to the fullest. “Those were chapters in my life that are over, ” he said when I asked him what his strongest memory of his childhood was. Past is past. He lives in the here and now. 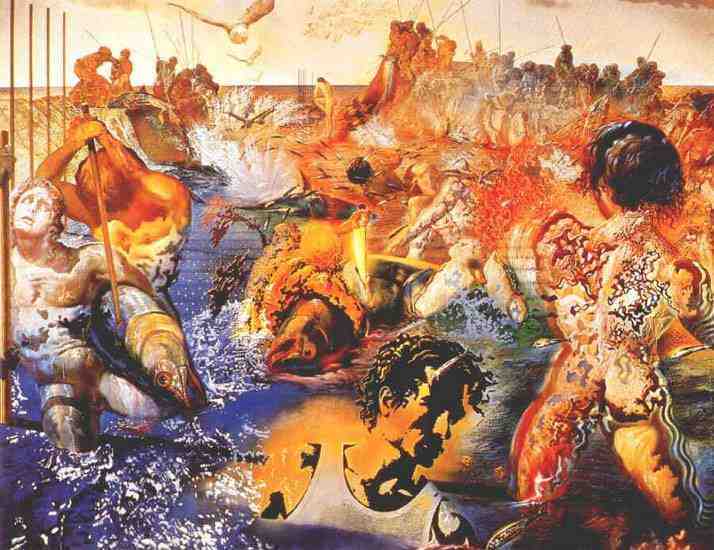 He has many favorite artists and art work but one that came to his mind instantly when I asked him was Der Thunfischfang by Salvador Dali. His artistic outlook on life is to simply enjoy life and it’s beauty and ugliness equally while looking at it in fascination and awe. Sometimes music by The Residents inspires him to paint, on other days it might be loneliness. Mischa Schenkel loves to be alone and sometimes “it is not lonely enough“. He dislikes that there is barely any support for artists in Germany but otherwise nothing gets him angry; not even his headaches that he suffers from occasionally. His dream would be to leave Germany and live somewhere warm, with a beach and a lot of sun. As long as he is in nature, everything is okay. He loves to enjoy life to the fullest because everything could be over in a heartbeat. Time goes by way too quickly. Mischa Schenkel’s art work is a glowing collection of fascinating and somewhat grotesque paintings. Sometimes, like in real life, it is important to look really closely to see hidden details and secrets in these paintings. He has much more in his repertoire, a plethora of oil and acrylic paintings and a great amount of portraits of beautiful women. Schenkel does not limit himself to one style or a particular medium. His life and art are very closely related, I believe. There are no major changes in his work or styles but some I pieces represent important turing points of the artist. One thing is clear while looking at all his artwork: The artist is very talented and dedicated to his work. Some of Schenkel’s painting seem to hold up a mirror to society and show in what ways certain things are wrong. Currently, we are working on an art exhibit and to display Schenkel’s work in an art gallery. Stay tuned for more information. In the meantime, see more pictures and send me a message/email through Contacts if you need further details on the artist or his paintings. Enjoy and Get Inspired! Next PostNext The Book Review: Maestra by L.S. Hilton.